What I like about TradeKing is not only that they have a nice web interface, excellent customer service and cash bonus promotions (the latest one just ended on January 31st), but also that they constantly roll out new products and services to improve user experience, whether it’s trading or education, with the popular discount broker. Early last month, TradeKing released its mobile trading app for iPhone after an early release of a BlackBerry app. Now they just launched a brand new education center for investors to learn more about stocks, bonds, options, ETFs, and mutual funds. 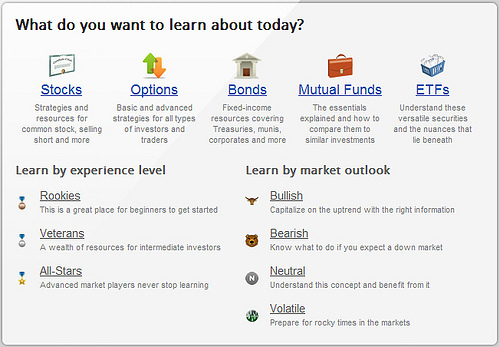 A central homepage that helps investors quickly identify the security they want to learn about, and how they want to learn about it, based on skill level (rookie, veteran, All-Star) or market outlook (bearish, bullish, neutral, volatile). 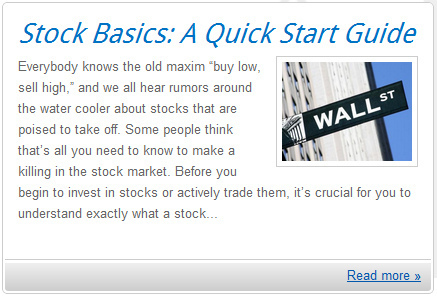 Drilldown sections for investors to gain an in-depth understanding of stocks, options, ETFs, bonds, and mutual funds. Each section offers a description of what the security is, along with a myriad of “plays” or strategies investors can use with that security. Each strategy is augmented with related on-demand video and blog content and supporting tools. Links to helpful tools and information sources, such as handy trade finders, relevant calculators, charts, glossary of terms, TradeKing’s Quick Start guides, book suggestions and FAQs. Detailed information with each trading strategy or “play” that follows the plain-spoken, easy-to-follow style of TradeKing’s popular Options Playbook. Each description covers time horizons, when to get in and when to get out of the investment, how to manage the investment, its volatility, margin requirements, tax ramifications, as well as important tips to improve your chances of success, plus related strategies to fine-tune your approach. Snapshots with each strategy outlining who should run the play, when they should run it and for what market outlook. I haven’t got a chance to check out all the educational materials offered through the new center yet, only took a quick look at the Stocks section, which contains some useful stuff, for both beginner (such as the stock basics and explanation of the difference between buy and long, and sell and short) and advanced investors (topics such as sort selling and how to write covered calls, etc). In addition to the basic materials for investors to read, the new education center also offers stock trading strategies for investors. Some of the investing strategies include long common stocks, short common stocks, protective put, collar, etc. Of course, you can also find a stock screener over there. For me, there are lots of information to be explored. If you are interested in educating yourself on trading and investing, go check out the TradeKing Education Center. It’s free so you don’t have to have an account to use it. If you want to learn more about TradeKing, be sure to read my updated TradeKing review post.